A spectacular Mordor-style eruption has hit the Villarrica volcano in southern Chile, spewing ash and lava up to 3 kilometers into the night sky and forcing the evacuation of nearby towns and villages. Some 3,385 people have been moved from communities surrounding the volcano, according to the mayor of Pucon, a nearby town. Interior Minister Rodrigo Penailillo said there were no reports of any injuries. But although the fireworks display from the volcano was breathtaking, a major lava flow isn’t expected. Intermittent gas and steam continue to be erupted, although the situation remains volatile. 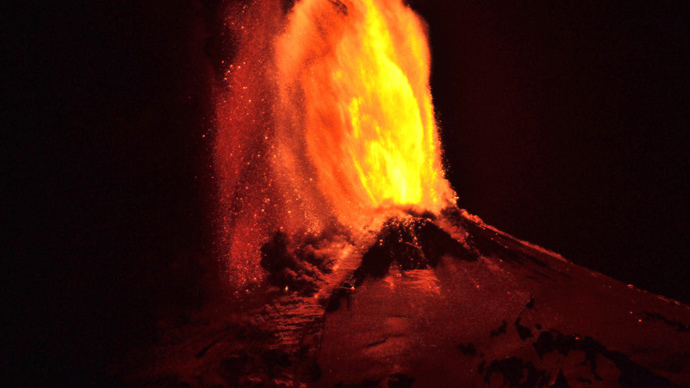 "After an eruptive pulse, which was pretty intense but very short at 3 am (0600 GMT), the volcanic system remains unstable and it is possible that something similar could occur again in the next few hours," the head of national geological service Sernageomin said on Tuesday morning. There is no danger to aviation in the area. Juan Carlos Rojas, head of air transit at the government’s civil aeronautics division, said that ash from the volcano was well under flight paths used by commercial airliners. After an emergency meeting on Tuesday morning, Chilean President Michelle Bachelet said she would travel to the affected area. Edward Reilly, a holiday maker, told Reuters that although tourists were trying to get out of the area, the locals didn’t seem particularly worried. “The volcano is quiet now, very calm. You wouldn’t know anything had happened,”he said. The Villarrica volcano is about 750 kilometers south of the capital, Santiago, near the popular resort town of Pucon in the so-called Pacific Rim of Fire, the second largest chain of volcanoes (after Indonesia) in the world. Chile has 2,000 volcanoes in the Andes, of which 90 remain active. The last major eruption of Villarrica was in 1985, and more than 100 people are thought to have died in mudflows on it slopes throughout the 20th century. When it erupted in 2011, the neighboring Puyehue volcano sent a huge cloud of ash into the atmosphere disrupting flights for months in neighboring Argentina.